‘The Man Down Project’ is a direct response to men being told to ‘Man Up’. Our fathers, brothers, sons and friends are being brought up in a society where we (men) have been pressured or conditioned into behaving in certain ways to ‘fit in’ to the stereotype. The idea that strong and silent is alluring or attractive leads to us (men) being unable to express our true emotions. 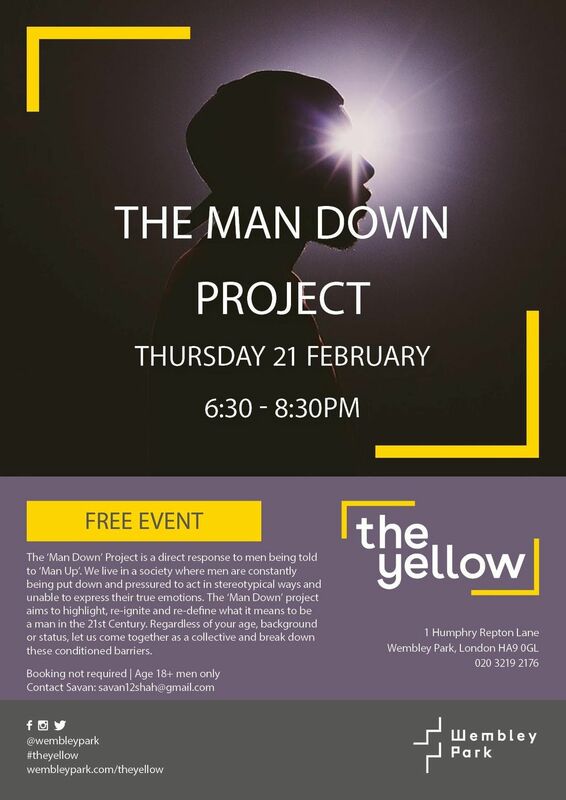 ‘The Man Down Project’ is to create a non judgemental space that will highlight, re-ignite and re-define what it means to be a man in the 21st Century. Regardless of your age, background or status, let us come together as a collective to become more mindful and break down these conditioned barriers. We have noticed a considerable increase in people talking about men's mental health and to find ways to remove the barriers to speak up about such ‘taboo’ topics. ~ Being unable to express my true feelings whenever I was out with my male friends due to a fear of being judged by them. ~ Not having a father figure to guide me through all cycles of being a man. ~ Putting pressure on myself to be good enough in terms of my physique, wealth and attitude. ~ Feeling pressured by my male friends to change my behaviour to sexualize women. Each meet up will be facilitated by a professional, with a clear agenda of what to expect and shall be supported by other organisations/charities who work closely with men’s mental health as well as creating spaces for men. ~ Explore what it means to be a man in the 21st Century through healthy discussions where we can start to question our current ways of living and the perceptions we hold. ~ Create a support group where we can be conscious listeners. ~ Express any thoughts or feelings with regards to the pressures being felt by men. ~ Share mindful techniques to cope with the pressures felt of being a man. Looking forward to seeing how we can support each other to have healthy discussions and start to take back what it really means to be a man.